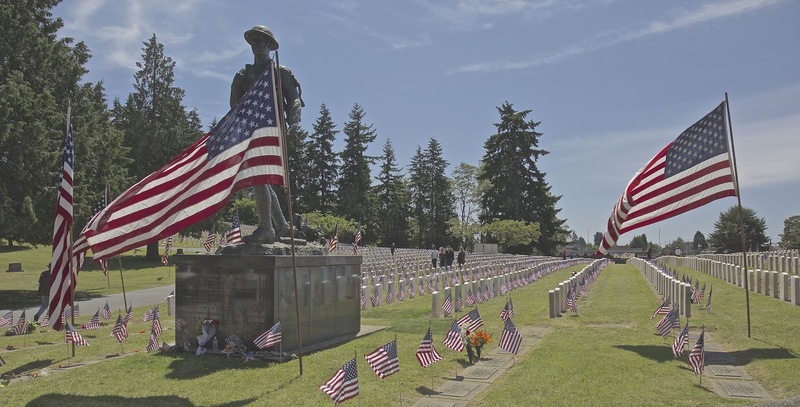 On Monday, May 28, 2018, hundreds of veterans, their families and the public will gather for the 92nd Annual Memorial Day service and concert in the Veterans Memorial Cemetery located at 11111 Aurora Ave N in Seattle. Scouts, churches, local organizations and families will place flags on all the graves in the Veterans Memorial Cemetery early Monday morning. The 1:30pm concert will feature marches, patriotic selections and other music provided by the Seattle Pacific University Symphonic Wind Ensemble and Drum Corp, Daniel Helseth, Conductor. The Service of Remembrance begins at 2:00pm, following the concert. Lieutenant General Gary J. Volesky is the Commanding General of I Corps and Joint Base Lewis-McChord. He is an Infantry Officer who has commanded Soldiers at all Army levels through Corps including company command in the 8th Infantry Division and and 3d Armored Division, battalion and brigade command in the 1st Cavalry Division, and division command with the 101st Airborne Division (Air Assault). He has also served as the Army Chief of Public Affairs, 1st Cavalry Division Deputy Commanding General (Operations), III Corps Deputy Chief of Staff, Infantry Doctrine Division Chief and multiple assignments within the 75th Ranger Regiment. Lt. Gen. Volesky has deployed six times to combat for more than 60 months to Iraq and Afghanistan in support of Operation Iraqi Freedom, Operation Enduring Freedom and Operation Inherent Resolve, and one humanitarian assistance deployment to Liberia in support of Operation United Assistance. 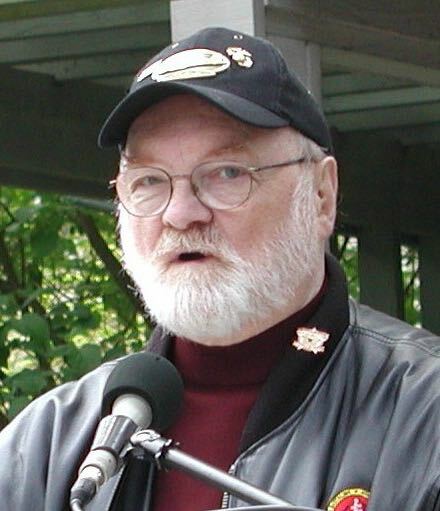 He is a graduate of the US Army Command and General Staff College and the Air War College, and holds a Bachelor’s degree from Eastern Washington University and a Masters degree from Princeton University. Lt. Gen. Volesky’s major awards and decorations include the Distinguished Service Medal, Defense Superior Service Medal, Silver Star, Legion of Merit, Bronze Star, Purple Heart, Southwest Asia Service Medal, Afghan Campaign Medal, Iraq Campaign Medal, Inherent Resolve Campaign Medal, Global War on Terrorism Expeditionary Medal, Global War on Terrorism Service Medal, Combat Infantryman Badge (2nd Awaeard), Master Parachutist Badge and the Army Ranger Tab. Michael Reagan has raised over ten million dollars for charities across the country; primarily with his artwork. Now Michael has begun what he calls “the most important project he has ever done”, The Fallen Hero Portrait Project. He is creating portraits of all of the Fallen, free of charge for their families. So far he has completed over 5300 free portraits. In 2007 Michael was awarded the American Legion’s Patriot Award and in 2009 the VFW Commander in Chief Gold Medal of Merit. Then in 2010 he was named the 2010 Veteran Volunteer of the Year in Washington State. In 2013 the Department of the Army awarded him the The Outstanding Civilian Service Medal. In March 2015 the Lynnwood Elks presented him the General Douglas MacArthur Award, and on March 25, 2015 he was awarded the Citizen Service Before Self Honor (known to some as the Civilian Medal of Honor) by the Medal of Honor Foundation in Washington DC. On April, 10, 1968, after serving his country as a U.S. Marine, Michael returned home from Vietnam. He knew he had been spared for a reason and needed to discover what that reason was. While in ‘Nam, Michael drew portraits of his fellow Marines. In some cases, those images were all that returned home. Michael developed an idea. He began drawing two portraits of a celebrity, giving them one and asking them to autograph the second original drawing. Then he donated the second drawing to local charity fund-raisers. Michael’s first drawing featured Warren Moon. He donated that drawing to the Fellowship of Christian Athletes fund-raiser, it fetched $1,800. Michael had discovered his purpose. Since that time, Michael has completed over 10,000 portraits of more 2,000 different celebrities and notable personalities. His art is so popular that his method of obtaining priceless autographs has changed. Now when he draws portraits he asks the celebrity to autograph as many as 10 blank illustration boards. He continues to donate these images to fund-raisers throughout the nation. The Program will begin with the Parade of Colors. The Color Guard is from the Washington State National Guard. Following will be the National Anthem which will be sung this year by Maria Kesovija, and the Pledge of Allegiance led by Andrew Chumney and William MacCully. Chaplain Edward Fackler will lead us in the Invocation and Benediction with the Memorial Day Address by Lieutenant General Gary J. Volesky, Commanding General I Corps, and Michael Reagan of the Fallen Heroes Portrait Project. Wreath Placement Ceremony will be led by the Advisory Board. The program will conclude with a ringing of the Liberty Bell 21 times by Vernon Zimmerman, followed by the Retiring of the Colors. The program should end about 3:00pm. The public is invited to visit the graves of our Medal of Honor Recipients. Evergreen Washelli is proud to hold the remains of several Medal of Honor Recipients. Please join us today in remembering them. We invite you to visit their graves, read their stories and see an image of the medals received. Located on the east side of Aurora Avenue are six Medal of Honor recipients. Three are interred within the Veterans Memorial Cemetery, and three are located in Sections O, R, and W. You will find one additional Medal of Honor Recipient across the street on the west side of Aurora. From the northwest corner of the cemetery you will see his family plot just south of the Arbor Crest Mausoleums. To assist in finding their location we roped off the gravesites. Maps are available in the program. It is so great that you have this memorial. My wife and I come every year. It serves as a great reminder to us all of just how lucky we are to live in America. Please never stop.